This evening I made a homemade charcoal face mask for Aub and I. Mad was already asleep, no real surprise there for anyone that knows her well. Our five year old, Bitty, however was wide awake and wanted to partake in the mask wearing. So we whipped up a mask more suitable for her. She was one proud little lady and even called her Paw-Paw on FaceTime to show him. 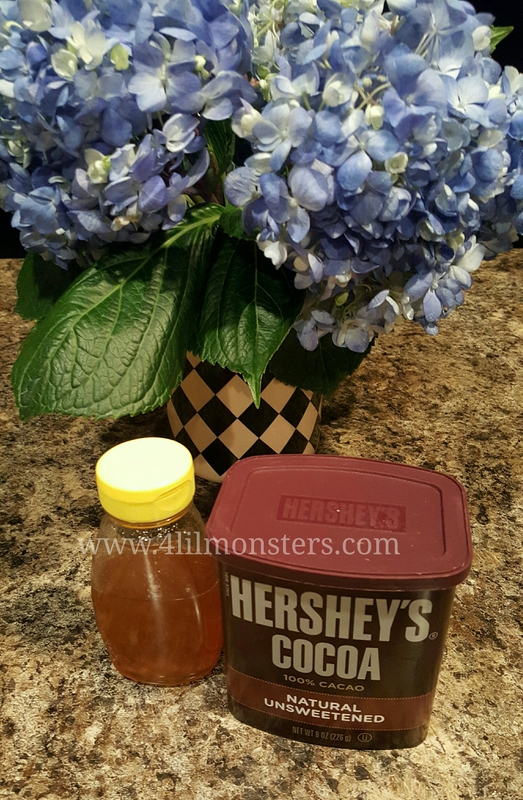 We mixed equal parts of the cocoa and honey. About 2 tbsp of each, until blended well. Be sure to avoid eyes while applying. I left it on her for the 20 minutes that I wore my mask. We refrigerated the leftovers in a mason jar so that Mad can have a chocolate mask too if she’d like. Maybe next time I’ll make it with their homemade hot cocoa!